At Artelia, we select only the best diamonds from around the globe. All of our stones are GIA certified and hand selected to ensure only the finest in quality make it into our designs. GIA, or the Gemological Institute of America, is the strictest diamond grading body in the world, who are dedicated to maintaining the highest standard of diamond grading through strict professional standards and the knowledge of the world’s best gemologists. The GIA grades diamonds by colour, clarity, cut and carat - the universally accepted standard for establishing the quality of any diamond. When grading the colour of a diamond, it is actually the lack of colour that determines the quality of the stone. A stone that is graded as the highest quality in colour (known as a D colour stone) is completely colourless, to best complement the many other features of the diamond. To determine the colour grading of a diamond, the GIA will compare the stone in question to master stones of established colour value in controlled viewing conditions to accurately identify the diamonds colour. As pictured below, the diamond colour grading scale ranges from D to Z in colour, with stones between D-F being considered colourless, and stones between G-J near colourless stones. While slight colour differences may be invisible to us, these changes are capable of making large differences in the quality and price of a diamond. The GIA established the D-Z colour grading scale to create a consistent and strict grading language that would be notably different than the variety of inconsistent and unregulated colour grading systems that had come before. At Artelia we stock diamonds between D and H in colour, although we are more than capable of sourcing stones of any colour grade to be used in remodelling or fixing existing rings, in situations where it is essential that all stones be identical in colour; for example to replace a missing diamond on a diamond band or in the halo of an engagement ring. It is important to note that diamonds can also be found in a variety of colours such as champagne, cognac, black and pink. These colours are referred to as ‘fancy colours’ and are evaluated by a different set of colour standards. Similar to the assessment of diamond colour, clarity refers to the absence of inclusions and blemishes. Natural diamonds develop organically deep in the soil of the earth, as a result of carbon being exposed to extreme pressure and intense heat. During the creation of a diamond, a variety of internal characteristics called ‘inclusions’ and external characteristics called ‘blemishes’ can become part of the makeup of that stone. These inclusions and blemishes are natural to the diamond, however when grading the clarity of the diamond the measure of perfection is a stone that is (as much as possible) free of internal and external markings. Establishing the clarity of the diamond involves evaluating the number, size, relief, nature and position of these inclusions and blemishes, as well as how these characteristics affect the appearance of the diamond as a whole. Many of these characteristics are much too small to be visible to the untrained eye, and often are only visible to the expert diamond grader who evaluates the stone, however these marks are the measure of overall quality in the clarity and appearance of every diamond, and as such are examined accurately and expertly by diamond grading professionals. The scale on which diamond clarity is measured ranges from flawless and internally flawless stones, to stones that are graded as Included to varying degrees, as pictured below. At Artelia we hand select all of our diamonds to ensure that they are all ‘eye clean’, meaning that all of our stones only have inclusions that are minor, widely spaced (clusters of minor inclusions can be visible to the untrained eye if positioned poorly), and located only away from the centre of the stone, so that when the wearer looks into the table of the stone, these internal inclusions are not visible. When a diamond meets all of these criteria, the difference between a VS1 stone and an SI2 can be almost entirely invisible. The cut of a diamond is largely responsible for its stunning sparkle and amazing ability to transmit light, and as such it is extremely important that the cut of a diamond is graded with expert precision. The effectiveness with which light is reflected by the diamond is determined by its proportions, and the angles of its many facets. This means that while the clarity and colour of a diamond are both important to the value of the stone, cut is the deciding quality that separates a dull and lifeless stone, from an immensely beautiful diamond. The pavilion is the faceted portion of the stone that angles inwards from the crown and into the culet of the stone, the angles of which are responsible for the diamond's ability to reflect light. The girdle is the flat edge that wraps horizontally around the stone. It serves as the meeting point of the crown and the pavilion, and is the point at which the claws of the ring rest to hold the diamond in its place. The culet is a flat surface on the very bottom of the diamond, where its pointed tip has been removed. The purpose of the culet is to strengthen the fragile tip of the diamond and prevent the possibility of chipping when the diamond is set. However, a poorly cut culet can be visible through the table of the diamond, and looks like a flaw or hole in the stone. The table is the flat surface on the face of the diamond that acts as a window to the center of the diamond. Light is thrown around the pavilion and reflected out to the viewer through the table of the stone. The table then connects to the faceted crown of the diamond. The GIA grades the cut of a diamond by a series of individual qualities, all of which are contributing factors to the final grade of every diamond. These factors include brightness, fire, scintillation (referring to the appearance of the diamond) and polish and symmetry (referring to its craftsmanship and design). Brightness refers to the internal and external white light reflected from a diamond. Fire refers to the ability of the diamond to scatter white light into all the colors of the rainbow. Scintillation refers to the amount of sparkle a diamond produces and the pattern of light and dark areas caused by reflections within the diamond. Polish refers tot he smoothness of the stone's facets, free from scratches, abrasions and other elements contributing to roughness on the surface of the diamond. Symmetry refers to the precision with which the diamond is cut, creating a perfect alignment of its facets. 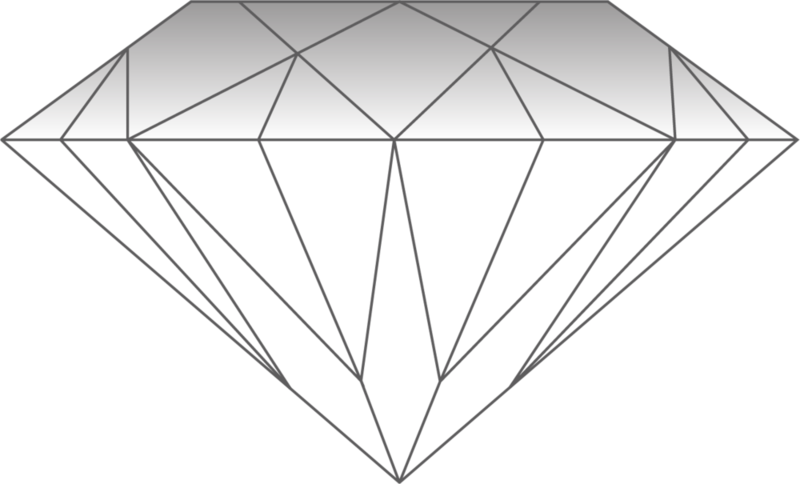 The standard unit of measurement for the weight of the diamond, a metric carat is defined as 200m milligrams, with each carat being divided into 100 ‘points’. This allows very precise measurements of the weight of a diamond, down to the hundredth decimal place. This also means that a diamond below one carat can be described by its points alone. A 0.25ct diamond can be referred to as a quarter of a carat, or it can be described as ‘twenty five points’. Often the carat measurement is mistaken as a measurement of size, and while the size and weight of a diamond are relative to one another, the visual size of the diamond varies depending on how the diamond is cut, and the details of its proportions. A stone that weighs one carat, and is cut with a shallow pavilion will have a larger table, and appear larger; while a stone that weighs one carat and is cut to have a particularly deep pavilion will have a smaller table, and appear smaller. Although it is important to note that neither of these stones will sparkle as brilliantly as a well cut stone. Poorly cut stones with a deep pavilion will appear to have a smaller table, meaning it appears smaller from above despite its weight being the same as the other stones. The deep cut also affects the brilliance of the stone, negatively affecting its ability to reflect light. Despite the size variation in stones of the same weight, nothing will be as beautiful as a perfectly cut diamond. While weight and size are clearly related, the carat weight of a diamond is not its size, and the cut of each and every stone is essential to its value. Poorly cut stones with a shallow pavilion will appear to have a larger table, meaning it appears bigger from above despite its weight being the same as the other stones. Despite this larger size, the brilliance of the stone is still negatively affected. The value of a diamond often increases with it’s weight (assuming all other qualities remain the same), as the larger the diamond, the rarer they are in nature. Because of this relationship between carat weight and value, often the most simple way to adjust the cost of a piece of jewellery is to adjust the weight of the centre stone, rather than sacrificing the quality of the diamond.